Nautique hosted students from the Advanced Manufacturing & Innovation Academy program at Lake Mary (Fla.) High School. Nautique welcomed students from Lake Mary (Fla.) High School to its world headquarters and manufacturing facility in Orlando, Fla.
Nautique hosted students from the Advanced Manufacturing & Innovation Academy program at Lake Mary (Fla.) High School on Friday in celebration of National Manufacturing Day. Each year, organizations from around the United States participate in National Manufacturing Day, inviting students from their local communities to share manufacturing career opportunities. 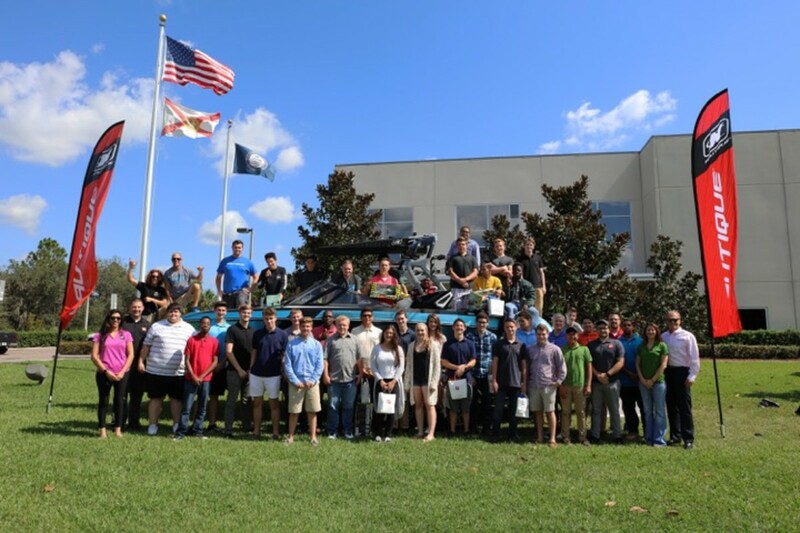 Partnering with local organizations that include the Manufacturers Association of Florida, Nautique gave students an experience at the company’s world headquarters and manufacturing facility in Orlando, Fla.
After an in-depth tour and departmental presentations, students applied the manufacturing principles and concepts they learned through hands-on activities. After lunch, the students were given the chance to experience the final product on the water. Nautique professional athletes Shaun Murray and Bob Soven gave students boat rides and put on a show behind 3X wakesurf and 4X wakeboard boat of the year the Super Air Nautique G23.